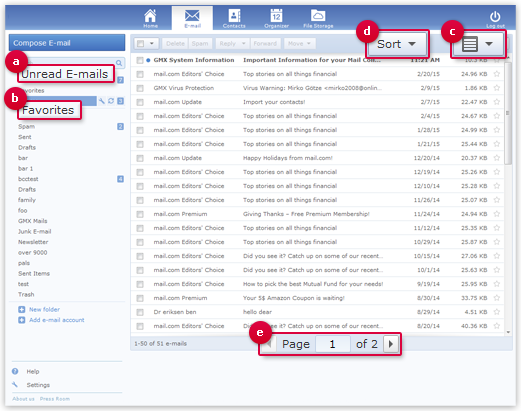 mail.com gives you many options to change the view or the sorting of your e-mail. So you can keep a good view over your e-mail. All unread messages appear in the Unread e-mail (a) view. After you read the e-mail, they will remain in the relevant folders, e.g. Inbox. You can deactivate the Unread e-mail view. You can mark all the important messages as favorites with a star. These messages will then appear in the Favorites (b) view. In the Unread e-mail and Favorites views, your e-mail are sorted by folder. You can deactivate sorting by folder. By default, your e-mail is sorted by date in descending order. You can use the Sort (d) button to select a different sorting method. At the bottom of the list of e-mail, you can scroll (e) through all the pages of your e-mail if the number of e-mail exceeds the amount shown on each page.